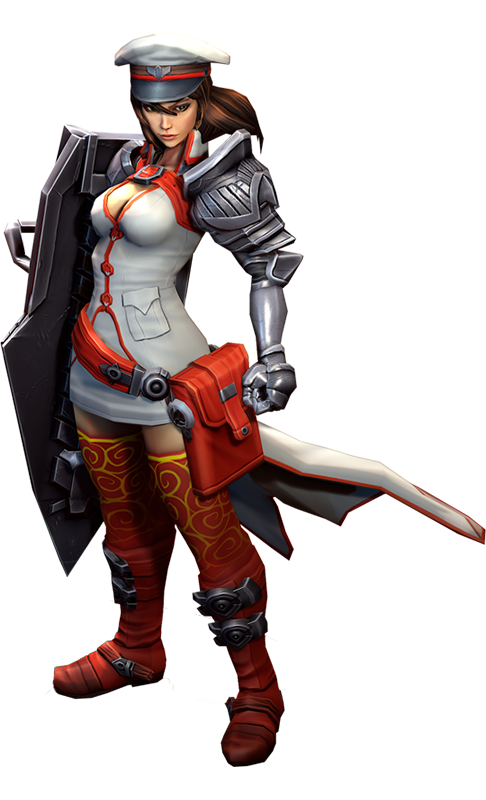 Catherine gains 1 armor & shield every time she stuns or silences an enemy hero with her abilities. Catherine gains a burst of move speed. Her next basic attack is replaced by a powerful stun attack. Resets basic attack cooldown on activation. 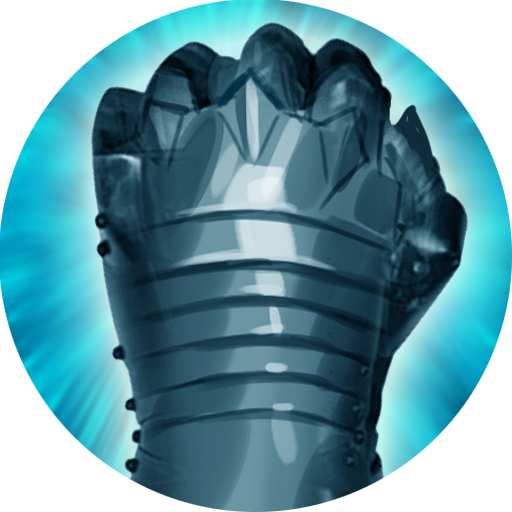 Activates a pulsating bubble that burns nearby enemies and deflects damage above 77 (+7 per level) to nearby enemies. Each deflection reduces the shield duration by 0.5 seconds. 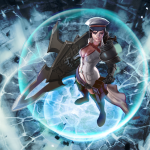 Catherine slams the ground, damaging & silencing enemies in a large cone in front of her. I had a prototype for Catherine’s skin that didn’t sit right with me, so I left her alone for a long time. The appearance of the Storm Queen in the lore gave me a strong direction. Paragon Catherine is intimidating. She’s the tip of the spear of the Stormguard. She’s Lancelot and the Black Knight in one. Knighthood means service, and in this case, service to her queen. The true story of Catherine’s role in Julia’s death is finally told. A single candle on the table at the back of the tavern flickered a light too weak to penetrate the heavy hood of a woman sitting alone, staring at the leaves swirling in her steaming cup of tea. She’d been sheltered all her young life from the roving bands of people whose old women wore clattering bangles up their arms and read the futures of gullible customers in tea leaves. Despite her thorough education, Julia would have paid well, in that moment, for such a service. Every head turned when Catherine entered. The red and white uniform was gone, but her drab hooded cloak failed to remove the disquieting sensation that a predator had stepped into the room. That heavy feeling did not waver despite the smile Catherine offered to Julia as she threaded through the tables to Julia’s booth, sweeping off her cloak to reveal a well-fitted dress true to the local style. Catherine stared the boy down, allowing him to stutter until he had found the end of a sentence. “Wine,” she said, a smile playing at one corner of her mouth. Catherine stepped close, one fingertip on the boy’s chin, turning his eyes back to her. “Red wine,” she murmured. Catherine scoffed, feigning hurt. “You are so unkind. I am quite proud of my disguise. And look– buttons!” She winked, spreading her arms. The glass in her hands exploded, shards of tinkling rain skittering across the table top. The tavern went quiet as all heads turned to Catherine as blood shimmering with halcyon dripped from her fist. “Neither you nor your sister ever consider the weight of your demands,” Catherine choked out, blinking away unshed tears. Julia swallowed against the knot in her throat. She took Catherine’s bleeding hands with all the patience she’d learned as a mother. “I am touched by your devotion, but I am not a person. I am an empire.” She pulled glass from Catherine’s palms, her voice a sing-song whisper. “If you deliver my children to my sister, she will make a monster of my daughter, put my son at the front lines of her military, and gain territory at the mouth of Gythia.” Blood and wine dribbled onto the floor as Julia cupped Catherine’s hands inside her own. Green light glowed, Julia’s healing power drawing strength from the halcyon, the lacerations closing. “Never feel guilty for what must be done. And… and..” Julia faltered, then stopped. “I will make it fast,” Catherine said softly. Julia’s shoulders wilted. She released Catherine’s healed hands. They slid out of the booth and stood, regarding each other across a distance that had grown, in only a few moments, unspannable. Catherine smiled and touched her hand to Julia’s cheek. “Hey, Cath,” Julia whispered back, a sob and a laugh catching in her throat. Catherine’s back straightened, her eyes cleared, and her hand returned to her side. She nodded once at Julia, grabbed her cloak, and stepped through her own spilled blood, past the silent patrons and their tracking stares, out the tavern door into the waiting night. Kestrel shot a withering glare down at the swordswoman who’d whispered it from the brush below. A soldier of the Stormguard knew better than to speak after positions were taken. Still, every woman hiding outside the indistinct farmhouse that evening had stood watch over the burial of the blonde woman who now struggled to unload a goat from a battered old cart outside the farmhouse. Julia should have been a ghost. The goat pulled at its rope, crying like a child. Kestrel waited in the tangled branches of an olive tree for Catherine’s signal in the same position she’d held for hours. The feeling had gone out of her legs long before. Her bow laid out sidelong in front of her, stringed with steel. She rubbed her gloved thumb and fingerpads together, savoring the spark under her skin, but she wouldn’t use energy arrows that night. Metal shattered glass, if the bow was strung heavy enough, and the detached Stormguard unit hadn’t used magic since crossing into Gythian territory. Techies didn’t trust magic, and the last thing they needed in this land of smog and machines was attention. Poking her tongue into her cheek, she watched the queen’s sister through her scope. Mothering twins had softened Julia’s body, and there were laugh lines by her eyes, but there was no doubt. After Julia went inside, Kestrel curled her toes to get the feeling back, rolled her right shoulder, sank her thigh into a knob in the branch, fit an arrow into the nock and hooted an owl call. Catherine whistled back the command to hold. The goat bleated louder and sadder as the sun sank. Nothing stirred in the surrounding brush and trees. Inside the window, Julia argued with her husband, some nobody from the rebel tech army. The twins flashed by in their pajamas, chasing one another to their beds. The boy gave out a shout that shook the ground and the setting sun brightened, then dimmed. Mageborn, Kestrel mused in silence. No wonder the queen wanted them unharmed. She waited until the kids were tucked in, took aim at the left edge of a front window away from the bedrooms, then repeated her signal. Catherine whistled again to hold. Night deepened, stars poking out that never showed above the bright light of Mont Lille. The man inside gestured with a wrench. Julia slammed a door. The goat’s shrieks twisted Kestrel’s nerves into a tight bundle. She’d hold position all night if needed, but every minute she waited was a minute something could go wrong. The man clamped a gauntlet on one arm. Animalistic hoots and whistles sounded from varied positions. Catherine’s hold command repeated again and the goat cried and something wasn’t right; they should have attacked an hour ago. “What the hell is she waiting for?” the swordswoman grumbled. Kestrel was used to lone missions, not all of this group planning. Too many other people to depend on. Too much noise. Couldn’t think. She let an arrow fly, and the goat shut up. The signals paused; someone in the brush snickered. Kestrel fit another arrow into its nock. The man paused, looked at his own reflection in the nearest window, then raced across the farmhouse to Julia. “He knows,” breathed the woman aground, bellying forward in the brush sword first. The whispers of steel unsheathing sounded all over the olive grove. Somewhere, a blue wisp of magic snapped on and off in the air. A glowing blue shield hummed to life. Hearts pounded in throats. The man inside struggled into his armor, his wife pinching her fingers on the clamps trying to help. It was “go time,” and all they needed was Catherine’s whistle. By the time the front window shattered, Kestrel had swung down from the tree. Ignoring the burning pins and needles in her legs, she ducked low and closed in on the farmhouse. Hanging from the windowsill by one hand, her bow slung over one shoulder, she glanced back at the storm of magic and steel following behind. Catherine stood behind the attack, tears in her eyes, a raven’s neck broken in her fist, another landing on her shoulder with an enraged scream.